Pilots are not made for normal audiences. When you make a television pilot, your audience is a group of network executives who make final decisions and test audiences who are used as a barometer of how America will respond to said pilots. It’s why pilots tend to be bigger, and broader, and in general more attention-grabbing—for better or for worse—than episodes that come after. In this way, Amazon’s “democratic” pilot process—in which they make their pilots available online for audience voting before making final pick-up decisions—is not necessarily out of the ordinary. Writers and producers have always known that their work would need to meet dueling expectations of executives and audiences, so we have yet to see a completely new approach to television pilots emerge from the process. However, the way each of this year’s comedy and drama pilots—I’m excluding the kids’ shows—engages with the specificity of the Amazon experience has been particularly fascinating for me, even in its subtlety. Part of this stems from the overdetermined nature of the audience feedback within rhetoric surrounding the series: in Amazon’s universe, customers are selecting what shows go on the air. Forget for a moment their Golden Globe-winning Transparent drew the least customer votes and scored the lowest customer scores during its pilot process—in Amazon’s mind, this is about the audience, and so it makes sense for producers to angle harder in that direction and play to their assumed test audience. Yet this is further amplified by the fact that there is even less clarity than usual regarding what precisely Amazon is looking for. Whereas working with a broadcast network or established cable channel gives you a basic sense of brand identity and programming strategy, Amazon has been all over the map, making it up as they go along. While we can start to see trends in their focus on Transparent’s awards success, we still have no clear sense of who their perceived audience is, or what their demographic priorities are. Do they want shows for men or women? Are they privileging comedy or drama? We don’t even know how many shows they’re willing to pick up, given that they have no “schedule” with empty slots, and have theoretically bottomless pockets from which to fund their move into original programming. 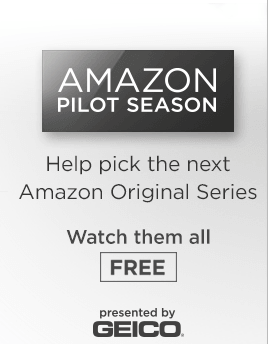 It’s plausible that those creating this cycle of Amazon pilots know more than we do about Amazon’s plans, but the fact remains that the audience is the clearer target, and there are a range of strategies that the pilots unfurl to ensure positive responses and high scores in the areas that they believe count most—or at least count a little—with Amazon. This week, after the documentary series The Chair—which I reviewed for The A.V. Club and covered with multiple interviews here at Cultural Learnings—reached the wrap of production on the two films based on the same script, Starz has made both Shane Dawson’s Not Cool and Anna Martemucci’s Hollidaysburg available on its Starz Play streaming site and On Demand. Viewers who watch both films can then register to vote for who wins The Chair’s $250,000 cash prize, with the results announced on November 8th. While both films had brief runs in theaters in Los Angeles and New York—and Pittsburgh, where both were filmed—and have been available for digital download since late last month, this marks the best chance for those who have been watching the documentary series to see how the decisions made by Dawson and Martemucci actually influenced the final product. As much as one continues to presume that Dawson’s extensive fanbase will tip the scales in his favor in the end, the survey nonetheless raises a more interesting question of how our reception of these films is shaped by both the broad terms of the experiment—two versions of the same script—and by the behind-the-scenes knowledge we have about how these projects came together. Accordingly, while the following are reviews of the films themselves, they are also inevitably reviews of how the films function as the “climax” of the “filmmaking experiment,” which is a distinct mode of evaluation that frames the films for better or for worse. On April 9th, 2010, I began an undertaking. Fifty-seven reviews and over six months later, I had to put that undertaking on hold indefinitely. There was some part of me who was naive enough to believe that I would be able to continue the Cultural Catchup Project while beginning my PhD, continuing to dig into Buffy the Vampire Slayer and Angel, but the truth was that it was never going to happen. While my dedication to the project never wavered, my free time during the year was going to go towards covering television as it airs, engaging in the post-air analysis that continues to draw me to writing criticism. Although I found some time to pull together the final reviews to finish out the series’ fifth and second seasons, respectively, the project went dormant for the better part of six months on November 25th. Since that point, there have been a number of mostly well-meaning prods in my direction regarding the project, but for the most part the Whedon fans have been patient. It helps, of course, that Noel Murray has been continuing his reviews of the series at The A.V. Club, and that the Whedon fan community remains vibrant and active regardless of my contributions. While I hated to be absent from the discussion, and I very much enjoyed the engagement made possible through those reviews, I ultimately had to decide how I wanted to watch these shows, and the idea of trying to squeeze them into an already hectic schedule just wasn’t an option if I actually wanted to enjoy the experience. But as the year comes to a close, and as the summer approaches, the season of Cultural Catchup approaches. There are no plans for serious overhauls: I remain vigilant in my efforts to avoid spoilers (although a few have sneaked in here or there, but nothing that I would consider major), I remain committed to doing both shows simultaneously (if only to add a bit of variety to my viewing, now that the crossovers seem to be slowing down), and I remain excited to continue the dialogue we began last year. Edit: Both reviews are now live via the links below! From there, things might slow down a bit until the weekend, but after that the adventure picks up where it left off: a summer-long journey as far into the Whedonverse as three and a half months will take us. I am hopeful that some of you will still be along for the ride, and that there might be some who are joining us for the first time: either way, the Cultural Catchup Project page offers the complete archives for those who want to relive it all again. In the meantime, spread the word – on Wednesday, the undertaking begins again. One of the features I often try to do for highly serialized and widely covered shows is “____ the Morning After,” in which I create a conversation between various reviews of a single episode of a series the morning after it airs. Given my interest in the response to HBO’s Game of Thrones, I had thought of doing a “Game of Thrones the Day Before” post to try to capture the pre-air response. However, this was a week ago, well before the internet has quite honestly exploded with reviews of this program (and reviews of those reviews). And with fan sites like Winter is Coming collecting those reviews, and with Matt Zoller Seitz doing yeoman’s work in breaking down the problems with Slate and the New York Times’ problematic reviews (the latter of which has already inspired a wide-ranging discussion of women and fantasy that has galvanized a larger fantasy community), the conversation has more or less already happened. To be entirely honest with you, it’s a conversation that has surprised me in its voraciousness, although I shouldn’t really be surprised. In general, pre-air reviews are growing passe within this industry, replaced with post-air analysis which more readily allows for reader participation – while a pre-air review will draw conversation from those who have predetermined opinions regarding a project, the real discussion can’t really begin until the reader has actually seen the project in question, and things seem to be moving in that direction as a whole. Of course, Game of Thrones is a unique example given that the most voracious participants in the pre-air conversation clearly have predetermined opinions about the project. This is understandable: Martin’s books have created dedicated fandoms, fostering a deep connection tested by reviews which actively challenge the legitimacy of the source material. As someone who has also read the books, and considers myself a fan of Martin’s writing style, I completely understand where these readers are coming from, and had similar reactions to those reviews. However, as evidenced by my post last weekend and some of the Twitter conversations I have been having this week, I have found myself interrogating the fandom and their approach to these reviews. I’ve come to realize that this perhaps seems unfairly critical: the worst behavior has been isolated within a small minority, and it is equally important to call attention to those reviewers who have shown contempt for fantasy as a genre or fans in general. Though this is true, I want to make clear that my criticism comes out of concern, not out of distaste. While the response to pre-air reviews may be understandable, I think the intensity of that response has brushed up against one of the biggest problems with pre-air reviews. Essentially, the reviewer and the commenters are coming from two completely different places: the reviewer has seen the show, and the commenter has not. While this does not mean that commenters are unable to take issue with the nature of the review, one can’t escape the fact that the situation is predicated on a dichotomy between a critic with access and fans following (comparatively) blind devotion to the source material. I want to take a moment ahead of tomorrow night’s premiere to contextualize my concern, and to emphasize the value of this fan passion in the week ahead – we sit at an important turning point, one that will empower the fans who have been anticipating the show for a very long time, and I do not want my concern to prohibit the kind of discussion that I feel this fandom and this show should inspire. We are entering the period in which HBO’s Game of Thrones will be placed under the critical microscope – while a few early reviews (my own included, I guess) were overwhelmingly positive, it was inevitable that some less-than-positive reviews would filter in. And thus begins the dance of deconstruction, as the reviewers interrogate the text and the fans interrogate the reviewers. It’s common practice in online criticism, although normally centered around films from beloved directors/studios or with considerable fan hype; by the time most television shows build up a substantial fanbase in later seasons, pre-air reviews are not particularly common, and are not nearly as contentious. At that point, the show has already been established, so a negative review is unlikely to make any real impact on a show’s success. However, Game of Thrones‘ built-in fanbase has created a scenario not unlike the Rottenwatch trend within film, as each review is dissected and analyzed in order to explain – or, rather, explain away – the writer’s disappointment. Now, I have to be honest when I say that I generally find this practice problematic, especially since many of the people who are leading the charge have not actually seen the episodes in question (although I take their point that some of the reviewers make it seem as though they haven’t seen them either). While I think there is value in analyzing reviews of a particular program, and would certainly agree with some of the criticisms that fans have had for the reviewers in question, I find myself uncomfortable with some of the dismissal strategies being used in the process. And, admittedly, I’m also uncomfortable that it’s only happening with the negative reviews.